Our cat Maggie was put to sleep Tuesday night around 10pm. She had Lymphoma and went from bad to worse. When I came home from work there was a pet mess that I won't describe in details. My guess is that she puked what little food she had in her stomach and then dry heaved whenever her stomach filled up with gas. We diagnosed her cancer a few weeks ago and we did attempt some chemotherapy treatment and the results were mixed. She seemed to respond at first but then after subsequent treatments, it seemed to take longer and longer for her to be anything that resembled her old self. We decided on Sunday that we would cancel her next appointment and as it turns out, she would not have made it there anyway. The Vet at the emergency clinic confirmed that she in all likelihood would have passed on her own soon and it would not have been pleasant. Indeed, she wasn't eating and was losing weight rapidly. We debated whether the chemo was a good use of money especially with kids and other upcoming expenses. We like to think that Maggie decided for us. She certainly did not enjoy going to the Vet or having the chemo. it's been a long time since I've had a pet that passed away. Growing up our cats were so messy and untrained that I made a conscious effort to not have any pets when I moved out on my own. when I met Nightingale she had Maggie and Austin and they were behaved. they were also 9 years old and had medical conditions which kept them from being the rambunctious kittens they use to be. Naturally I fell in love with them as quickly as I did with Nightingale. Our other cat Austin is walking around the house wondering why she isn't here. I don't know who is sadder, me or him. 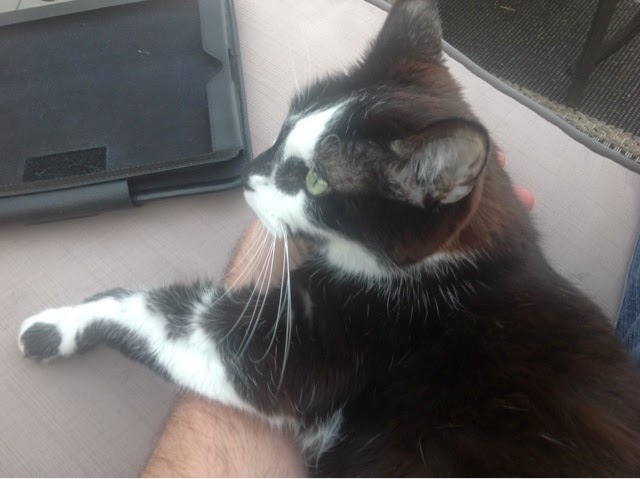 One of the things I looked forward to when working from home was her jumping on my lap and purring whenever I was on a conference call.